I’ve been going through a couple boxes of old family videos this week, finally getting around to transferring them from VHS to the computer and to DVDs (hopefully before they had begun to deteriorate!). I had not watched them in years and years. 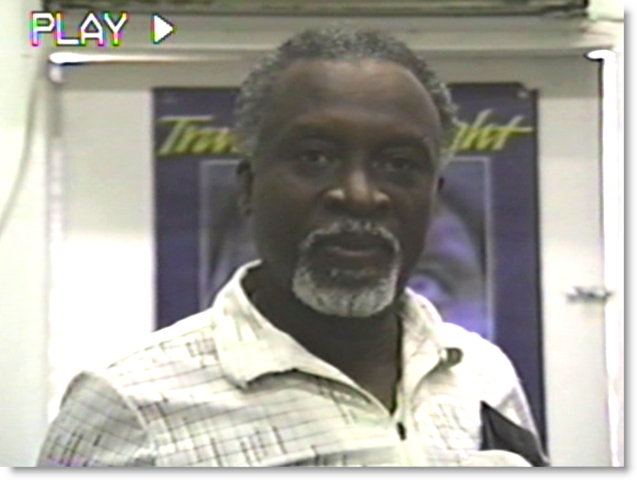 Right in the middle of a family tape from the late ‘80s and early ‘90s, I discovered a treasure trove of video from the 1990 Men of Gray movie’s production that G. and I shot in Trinidad – stuff that we both assumed was no longer in existence! I found a TV interview for national television that we did during production. 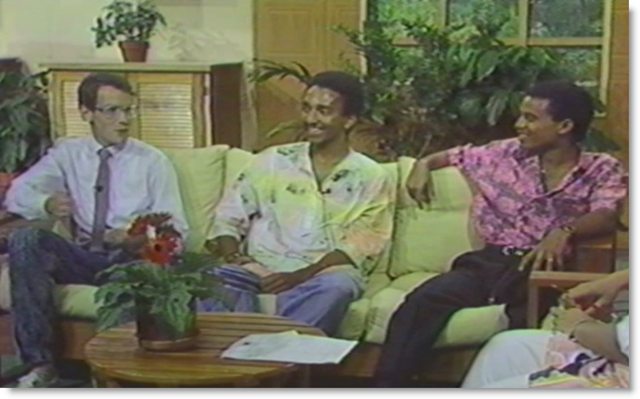 We were being interviewed on TTT (Trinidad & Tobago Television) — the country’s only station at the time. The show was called Community Dateline. I don’t recall the name of the show’s host, so please shout it out if you know. Being interviewed was me (Ric Moxley – as director, editor, and co-writer), the movie’s producer-writer-actor G. Anthony Joseph, and Corbi Hilburn, who DP’d the first half of the movie. There’s some fun stuff here, including a couple clips from the movie, behind the scenes stories, and more. I may put some of this up on YouTube, so you can see it too. What played on the tape after that interview was the real gold: several pieces of the raw footage (i.e., straight from the camera, outtakes and all) from the production. This is incredible. We thought that the original footage was history – completely lost. But there it is, in bits and pieces, unfortunately, but there it is. Sadly, some of it has been recorded over with family movie clips, like, “…And here we are in our new Sherman Oaks apartment with our newborn daughter” (who, by the way, just graduated high school this year, which really puts the historicity of this footage in perspective). But I never would have guessed that any of that raw footage would have survived. …is that, since the movie was mastered on 3/4 inch tape, and because all the editing was done during the pre-digital age (which means that even a master copy of the edited movie is a copy of a copy of a copy), any VHS copy I have of the edited movie suffers from some quality degeneration. So, to have come across segments of the original, unedited raw footage from production is a kind of goldmine for me. I didn’t find enough of it in this discovery to ever re-cut the movie, which is what I would like to do someday. But there is some good material there, including behind the scenes pieces and (what we thought was) off-camera banter, plus some worthwhile things we shot but that didn’t make the final cut. A lot of “B-role” material we shot while driving through the downtown Port-of-Spain city streets, capturing traffic, crowded sidewalks, police officers in action, famous landmark drive-bys, etc. – stuff I needed for cutaways and montages, etc. All the footage (takes and outtakes) from the Lavantille interior and exterior drug bust scene that we did with one of the Gopaul brothers (Dale, I think) and Julien. Several day and night exterior and interior car scenes between the characters Joe Cameron and his partner Ivan. 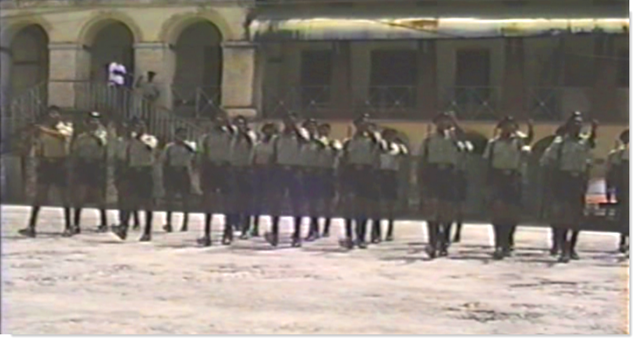 In-progress police training at the St. James barracks, used for cutaways and transitions, shown here. Chaguaramas sunset driving shots (for following thug Louie to the home of big-time dealer Marcus, where Joe and Ivan bus’ up d place. I think there’s about an hour’s worth of production footage altogether. Who knows? Maybe we’ll do something with all this someday. Like cut together a behind the scenes clip or two. Horace James. Wow. God rest his soul. 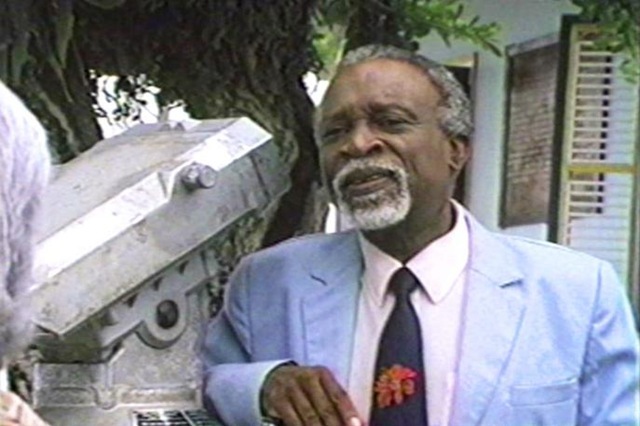 At the time (1990), Horace was the a head show producer at TTT and was instrumental in the success of this movie. First, while he wasn’t directly a part of the crew, Horace was a mentor to me and G., teaching us about the business of doing business in Trinidad & Tobago, which is a bit of an art. Second, he was a kindred spirit, feeling our pain and compassionately helping us through the trials and tribulations of making a movie. Third, he contributed pragmatically, being our primary liaison with the TV station, who sponsored much of the production and provided most of our production and post-production equipment. Horace’s office, which is where I shot this tiny snippet of video, even became our production office during production. Sadly, Horace James is no longer with us (nor is TTT). I sure do miss him. One of the good guys. And so, while It ain’t much, I’m glad to have uncovered the small bit of production office footage.